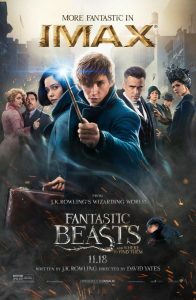 Adaptation of the book by J. K. Rowling, a spin-off that expands the world of the Harry Potter saga from the point of view of Newt Scamander, a magician who charge you to write a book about fantastic creatures. He ambientará seventy years before narrated in the movies the young wizard Harry. Production Co: Coproducción Reino Unido-EEUU; Heyday Films / Warner Bros.